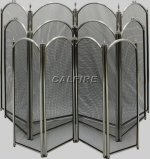 This 4 Fold Satin Nickel plated fire screen is available in 4 standard sizes. For easy storage it folds in four when not in use. A good looking, effective spark barrier. 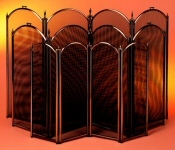 The 4 fold Brass plated fire screen is available in 4 sizes. Folds in four when not in use. A good looking and effective spark barrier. The 4 fold Antique plated fire screen is available in 4 sizes. Folds in four when not in use. A good looking and effective spark barrier. The Regal fire screen in black is available in 4 sizes. Folds in four when not in use. A good looking and effective spark barrier - blends in nicely.